various managerial problems. Although the organization formed a cross-functional team, in the needs definition process marketing needs became less of a focal point of the CDW. As the implementation progressed, more emphasis was placed on financial and billing applications rather than marketing. Marketing's unique needs in terms of analyzing past customer performance, incorporating outside data sources into its analyses, analyzing specific customer data and running targeted marketing campaigns, were not the needs of the underwriting, billing and other financial and strategic functions of the organization. All right, so we're using less than ideal ways of measuring the effectiveness of those things right now, I would say. Because we don't, I think, have the data or don't understand how to use the existing data (from the warehouse) well enough to be able to get at it. This is a matter of trusting this data and its quality to make major business decisions and we are not there, yet (marketing manager). "What would you expect from [our] data warehouse?" I would say that you either looking to do one of a few things[sic]. That is, decrease your costs, increase your membership - increase or retain your membership. 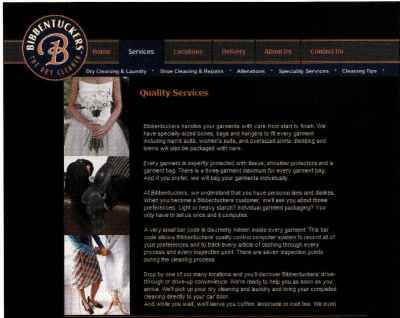 We cannot do this or it takes a LOT of work to meet our marketing needs (marketing manager). Marketers expected the interface to look like it had in training when a prepared dataset was used or to be similar to other packages that they used in their work, like SPSS. Marketers wanted "click and drag" and other systems features with which they were familiar from other marketing applications. Marketers participating in the focus group said they were less likely to use reporting tools (e.g. business objects) themselves and more likely to draw upon the expertise of local "power users." These users had become internal experts on the CDW application and, as a result, were somewhat overworked in the organization. In addition, these needs for external, demographic and descriptive data for the consumer market and Dun & Bradstreet company descriptive data for the commercial (B2B) applications which were missing from the data warehouse. Other missing data included information on former customers and prospective customers, neither of which are in the data warehouse. These data were in the system previously used by marketing. Focus group participants reported "reconciling" mainframe reports to the information from the data warehouse. In addition, overall quality issues were mentioned frequently, such as overall accuracy of the information and other dimensions of data quality. In fact, the general category of marketing needs included several categories that, after our initial analysis, also appeared to be strongly related to overall data quality dimensions (Wang and Strong, 1996). As can be seen from the coding dictionary in Appendix 2, by data quality the users meant data that were accurate, timely, easily accessible, easy to understand and believable, common ways of looking at quality from both the marketing (Parasurman et al., 1994) and information systems (Wang and Strong, 1996) literature. When users mentioned ease of use of the data warehouse interface in conjunction with the "data" itself," these comments can be seen as analogous to accessibility dimension of quality as noted in Wang and Strong (1996). Users also mentioned that they needed other data that were not in the warehouse, concepts which relate to the accessibility dimension noted in Wang and Strong (1996). In addition, users expressed interest in having access to a data dictionary, the concept of access relates to the perceived ease of understanding of the data as an element of data quality as well as accessibility. Users needed a dictionary because when accessing the data did not have an idea exactly what data items meant. Without a knowledge of the data items the users could not use the data. Perhaps most importantly, users and potential users distrusted data extracted from the warehouse; lack of interest relates to the intrinsic dimension of quality known as believability (Wang and Strong, 1996). 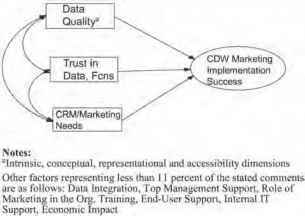 Because of the interrelationships between these concepts the revised model in Figure 2 also shows marketing needs to be correlated with data quality dimensions. Similarly, in Figure 2 trust dimensions are shown as correlated with needs understanding. It is certainly likely that the more marketing trusts that the organization works well and produced good quality underlying data, the more likely marketing will its needs are understood.